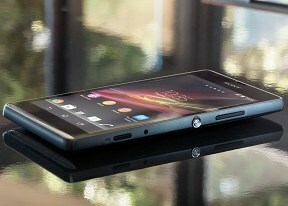 The Sony Xperia SP uses a Snapdragon S4 Pro MSM8960 chipset, which includes a 1.7 GHz dual-core CPU - planting it firmly in the upper end of the midrange. It does, however, feature an Adreno 320 GPU, the same found on the flagship Xperia Z, so we're expecting good performance when it comes to graphic-intensive activities like gaming. As we said, the Xperia SP is a midrange device largely due to its dual-core CPU, yet the processor is clocked quite high at 1.7 GHz, which resulted in some pretty good performance in the BenchmarkPi single-core CPU benchmark. When it comes to multiple CPU testing, the Xperia SP expectedly lands behind most quad-core devices, but not by much. In fact, the SP results act as a sort of bridge, landing somewhere in the gap between quad-core flagships and dual-core midrangers. Interestingly, the Xperia SP scored more than the Xperia ZL on GeekBench 2. We ran GLBenchmark off-screen, which means we're testing at a fixed resolution, which lets us test the raw GPU power. The Adreno 320 is currently one of the more powerful mobile GPU's around, and the one found in the Xperia SP didn't disappoint, scoring as high as the Xperia Z flagship. But most games will probably want to run at native resolution, so we're including Epic Citadel, which uses Unreal Engine 3. Unreal Engine is popular with mobile game makers, so it's a pretty important test. Here, the Xperia SP was able to top out are charts, but before we get too excited, let's keep in mind that the test is run in native resolution, which in the SP's case is 720p. Most of the other top scores are from 1080p-toting devices. Having tested many other droids with Google Chrome as the default web browser, we were expected a clearly midrange performance, but it turns out Chrome has become a lot faster after its latest software update. The Xperia SP scored 1116ms on SunSpider, which is the top result by a Sony device. In HTML5 BrowserMark 2 and Vellamo tests, the Xperia SP did very well, once again likely due to the Chrome browser's most recent optimizations. We're more than happy with the Xperia SP, and particularly impressed by the beefy Adreno 320 GPU found inside. While it cannot match the raw horsepower of some of the top dogs, the 720p display means there aren't as many pixels to push out, resulting in some great performance for its class.